Cold feet and high energy bills giving you the winter blues? There is a quick fix that can relieve your frozen toes and save you money in the long run. With more than 15 years experience insulating thousands of crawl spaces, RetroFoam of Michigan knows using spray foam to insulate the area can make a difference in the comfort of your home. Not every crawl space is made the same, so the size of the area to be insulated is the main contributor to the cost of the spray foam insulation project. The average cost to insulate a crawl space with spray foam is between $1,150 and $2,500. Looking for rough budget numbers to insulate your existing home? 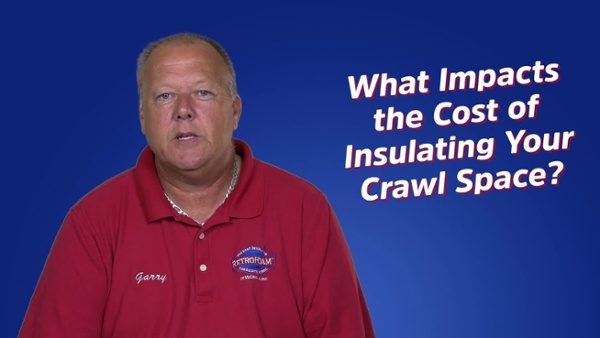 What Factors Determine the Crawl Space Insulation Cost? The biggest factor in the cost to insulate or reinsulate a crawl space is always going to be the size of the area. If crews are insulating the underside of the floor of the house or the crawl space walls and rim joist there is a world of difference between those two applications. That’s because there is so much more area to cover when insulating the under the floor compared to insulating the walls and rim joist. If crews are laying down plastic to create a vapor barrier, there is also additional charges for this as well. Another factor in cost is the material used to insulate the crawl space. We usually recommend an open cell spray foam, but there are circumstances when closed cell foam is a better option. Closed cell tends to be a more expensive product. There are several differences between open cell and closed cell spray insulation, including the composition, blowing agent, sound dampening capabilities, and moisture permeability. Spray foam insulation, regardless of the type, is going to create an air seal and insulate your crawl space. What are the Indicators the Crawl Space Needs New Insulation? Cold floors in your home is the most common indicator you need to insulate or reinsulate your crawl space. That’s because the air in the crawl space is cold. When a bridge freezes over faster than a road, it’s because it has cold air above it and below it. The same concept works in your house. When there is air movement on top of the floor and the crawl space isn’t sealed up, then the cold air below the floor moves throughout your home. You could also feel those cold drafts coming up around the bottom of your walls. Cold floors can lead to high energy bills and the cold air in your crawl space is also to blame for freezing pipes. In Michigan many homes have ductwork that runs throughout the crawl space, so if cold air is flowing around those ducts the hot air in them will cool down before they ever reach the vent in your bedroom or living room. 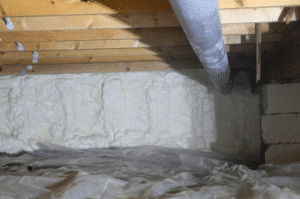 What are the Benefits of Insulating the Crawl Space? Floors are no longer cold. No more drafts along baseboards. Prevents pipes that run through the crawl space from freezing and bursting. In crawl spaces there are two ways to insulate – crews can either insulate the crawl space walls or the underside of the floor of the house. What determines which area to insulate depends on whether there is duct work or a furnace in the crawl space. If there are heat ducts in the crawl space, then a good contractor will want to spray the exterior crawl space walls and lay plastic on the ground. This system will help the heat ducts radiate heat in the crawl space which will heat it, thus also heating the floor. If there are no ducts in the crawl space, insulating the underside of the floor is a better option. Since there is no heat source this will cut the crawl space off from the rest of the house keeping it warmer. Essentially you won’t be getting that cooler air coming up through the crawl space. 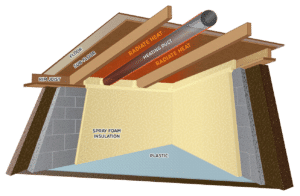 What is the Process for Installation of Spray Foam in the Crawl Space? On the first day of the job crews will come to the home and remove any existing insulation in the crawl space. The older insulation must be removed in order for the spray insulation to do its job. The next step is to lay down plastic if the walls of the crawl space are being insulated. The plastic covers the entire floor and if there are support beams the plastic will overlap around them so moisture can’t get through. The plastic is then rolled up the walls about a foot or so, and then the foam is sprayed on creating a seal. If only the underside of the floor is to be insulated, then no plastic needs to be laid down and crews will spray foam on the underside of the floor. Once the foam has been sprayed, crews will work to clean the area up and make sure it looks just like it did before the job began. A free estimate for the project. Free concierge program so someone stays with you throughout the entire project to answer any questions you may have. Help with applying for financing1 for the project. 1 With approved credit. Call for details, 866-900-3626. Crews cleaning out old insulation from the crawl space and disposing of it properly. Crews cleaning up after the project is complete so your home looks just as it did before the job was started. 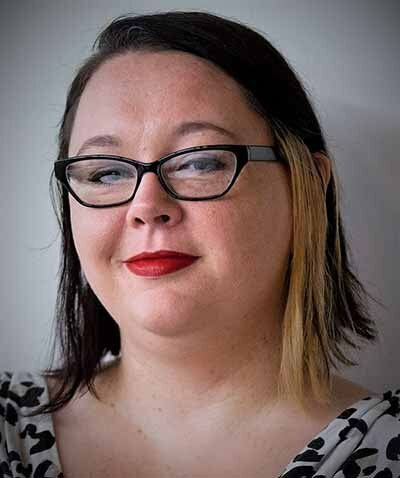 Your concierge applying for rebates so you get money back on your project from your energy provider. A lifetime warranty that is connected to the house. Sometimes cold air moving through a crawl space or attic can contribute to the discomfort you are feeling in your home, but sometimes there is more to the discomfort you are feeling. Insulating your entire home using injection foam and spray foam can make a difference year-round, not only keeping you cool in the summer and warm in the winter, but also saving you money on your energy bills. An experienced and trustworthy contractor won’t hit you with hidden fees and costs after the job is done. The estimate you agree to and sign should be the final cost of the project. When you are ready to schedule a free in-home estimate give us a call at 866-900-3626, or fill out the form on our website. You can also check out our foam insulation budget calculator to give you a rough idea of the cost of the project.